A few years ago our evaluation scores were based on test scores, and we had to predict early in the year how students would do on those tests, and set goals, with our administrators. This led to a lot of looking at data in order to set realistic, but reasonable goals for students. Because I am science teacher, there weren’t as many benchmarks as there are for reading or math. There is a lack of previous scores, and earlier science classes aren’t always indicative of how the students will perform in later classes. After looking at a lot of data, I found that the best predictor for my students’ science test scores was actually their reading level. This is so frustrating for us as teachers because the content we teach them is only part of the picture. It is also frustrating for students because they can’t really demonstrate what they know. As teachers we do have obligation to help fill some of these literacy gaps, but we also want to teach content, and not have the content get lost in the reading difficulties. 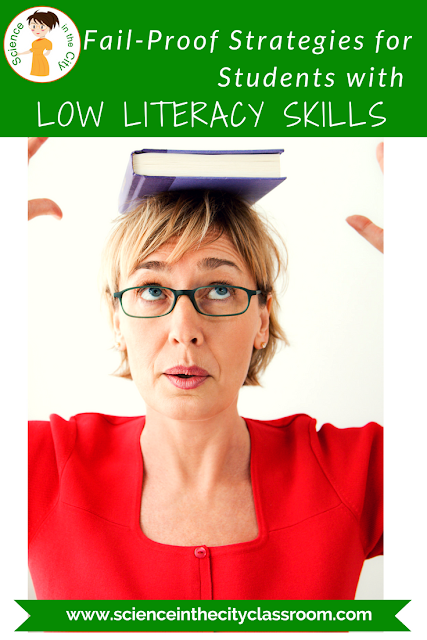 Where I teach there are so many students in my classroom who struggle with low literacy skills, and this is problematic for them in school, particularly in the upper grades where reading is no longer taught. Students who have lower literacy skills struggle and become disengaged with school, but as content teachers, or teachers of higher grades, we are not always equipped to teach reading skills. So what do we do? How do we help them in class? Use scaffolding tools such as text to speech, word walls, integrated instruction of vocabulary and more to allow them to build on their strengths, instead of focusing on weaknesses. Especially now, not all content has to be taught through reading and writing. We can, of course, lecture, but this may not hold students’ attention. Whether you want students to work independently, or in stations, another great way for students to learn new content is through videos, often with some type of guided notes, graphic organizer, or reflection tool. The options here are countless. You can still require students to use key vocabulary terms, but some students may struggle with the organizational/spelling/writing aspects. Instead, they could show their knowledge in other ways. Here are just a few options. If you have other ideas, please feel free to comment below, I’d love to hear! Some students cannot read content very well because they struggle with the vocabulary (either content vocabulary or tier 2 vocabulary). I have already written quite a bit about how I tackle vocabulary in my classroom in this post, here, and here and even for homework. In addition to vocabulary other reading skills can be taught. Students can practice making their own test questions, with answers to get used to the structure and language of test questions. They can also be taught to read and understand diagrams better. Particularly in science class there are often questions that involve diagrams. Even students who struggle with reading long passages of text can often understand a diagram and answer questions correctly. Next time you are working with a student whose reading levels are way below grade level don’t give up! And don’t let the student give up! Remember your goals: teaching content, assisting with reading, and teaching strategies. Both you and the student might be very surprised at how much he or she really understands when given the chance to express himself in other ways. When a student is more successful and confident in your class, they are more likely to continue to try harder and achieve greater success as well. If you try out any of these strategies, I’d love to hear how they go. Please leave a comment below, or send me an email If you would like to see any of the resources that I use with my classes, please feel free to check out my Teachers Pay Teachers Literacy Items. Reviewing for regents exams, or other state exams can be overwhelming. There is so much content: labs, diagrams, vocabulary, and just facts to know. Students want to do well, but they are tired, and they often don’t know how to study on their own. They don’t want to listen to you lecture, and you don’t want to lecture, but they need direction. When reviewing for state exams, in particular, it is critical to look back at past state tests and to see what has often been asked. For New York State those exams are available here. However, students quickly get bored and frustrated with simply doing past questions. This doesn’t give them a study tool, it often just shows them what they already know, or what they don’t know. Many students are not able to take this to the next level and use it as a study tool. For my year end review I like to assign something fairly open-ended, with choice for homework. This is something that students can make progress on their own, and won’t be studying ‘wrong’ but will be learning some study skills. One choice would be this free Review Assignment (applicable to any subject). This also eliminates the problem of cheating on practice test questions assigned at home. This is also a good time to utilize games and puzzles to break up review after students get bored of lecture and/or practice questions. A very popular way to do this is the use of Tarsia Puzzles (also called Magic Squares). The bulk of my review, however comes from this resource, which I have created. It is organized by main topics within the New State Living Environment Course (Biology). Each topic has one or two pages. It is in guided notes format, with key diagrams that need to be labelled, or bullet points that need to be filled in. It can be used in several ways. Hand out the entire packet at once, or I may hand it out one topic at a time, or only use some sections and review other sections in other ways. I will often put students in partners (or on their own) to complete a short section, then regroup and go over it. I have also had them complete a short section, check with a partner, and then check their answers against the key. A teacher answer key is included, so it is a very easy option if you want to copy the answer key for students (or a portion of it). I have also had students lead, up at the board, going over the answers with the answer key. Here is a free sample of one topic if you'd like to give it a try! It is open-ended enough that it keeps students actively thinking and engaged, but complete enough that it gives them a great study resource when they are finished. and human impact on the environment. The main points that are reviewed in each section are based on questions and topics that are most commonly asked on state testing. What Else do I do In Class to Prepare them for the Test? I usually review a topic or two using one of the above discussed methods and then do some practice past state test questions that draw specifically on that topic. This allows them to see the relevance and value of the review, and to have more success with the questions by being active participants in the review. I know the end of the year can be chaotic, but end of the year testing is still important to both you and the students and we all want them to do their best. This can even ben a time to try some changes to routines in preparation for next year, and to keep things fresh at the end of this year. I find this review structure (with some use of games or stations periodically to break it up depending upon your group and your time schedule) to be successful because students know what to expect, and they can see the purpose behind it. It is important that students buy-in to the review strategy, and understand what that the plan is, and the reasoning behind what you are asking them to do. Sometimes I even kick-off review with a contract that I have the students create and sign regarding which actions they plan to take to ensure that they do well (study each night, stay after school for extra help, participate in review, etc). This makes it clear where they are going. They can feel success as they complete it, and they also have a study resource when they are finished. Instead of being bored, students actually look forward to the structure, knowing what’s coming next, and seeing some progress in their learning and their scores. I hope you will head over here, check out the previews, and try it out for yourself if you teach Biology. Please let me know what you think! !